Home / Electric Power / How Do Power Plants Work? The common theme of this topic is the concept of a prime mover (source of mechanical energy) driving a dynamo (alternator or generator) that converts mechanical energy to electrical energy. Furthermore, we take a look at the basic working principle of common power generating plants. A Hydroelectric Plant is one that converts the kinetic energy in flowing water to electrical energy. 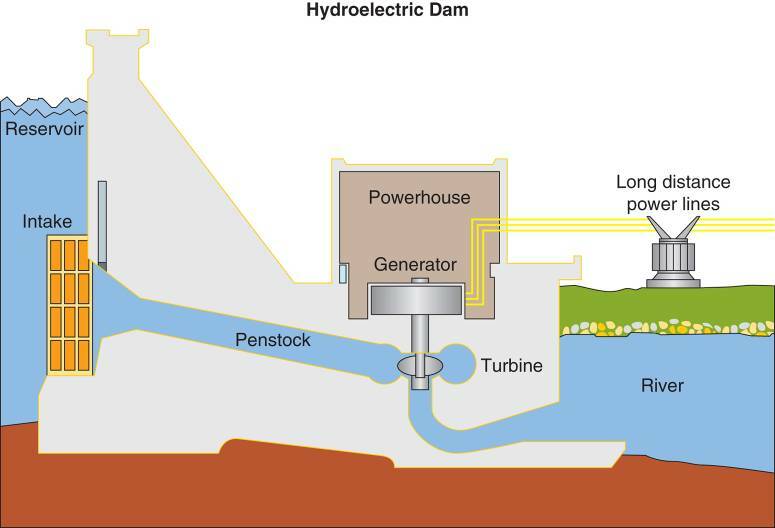 The basic structure of a hydroelectric plant is illustrated in Figure 1. The Turbine is a rotor with blades that are driven by water flowing through the Penstock, a conduit between the water reservoir and the power plant. Figure 1: A hydroelectric plant. The turbine drives the rotor of the alternator (generator). A step up transformer in the power station increases the alternator output voltage to a level suitable for transmission over long distances and connects that output to the power transmission lines. The Dams represented in Figure 1 is referred to as an Impoundment Dam. An impoundment dam completely blocks the natural flow of water from the reservoir to the river basin below the dam, the only path for water being through the penstock. In contrast, a Diversion Dam—which is simpler to design and build—does not block the natural flow of water through a waterway. Rather, it diverts a portion of the water through the penstock and turbine and then returns the water to its natural path. A Thermal Power Plant uses heat to convert water into a steam, and then uses the steam as the prime mover from its turbine. A thermal power plant operates as illustrated in Figure 2. The heat converts the water to the steam. The steam is then applied to the turbine (which acts as the prime mover for the generator), a cooling structure condenses the steam back into the water, and the cycle begins again. Note that the conversion of water to steam and back to water in a closed recirculating system is referred to as the RANKINE CYCLE. Figure 2: The Rankine cycle. Thermal power plants are classified by the type of fuel they use as a heat source. For example, a Fossil Fuel Power Plant produces heat by burning coal oil, or natural gas. A Nuclear power plant uses heat produced through a process called Nuclear Fission. The nuclear fuel is packaged in cylinders called fuel rods. The most commonly used fuels are uranium 235 and plutonium 239. As with any other type of thermal power plant, the heat produced by nuclear fission is used as the energy source in the Rankine Cycle. Nuclear Fission: A process of generating power by splitting the nucleus of an atom. Nearly all the commercially produced electrical power in the United States currently comes from Hydroelectric and thermal power plants. However, environmental issues—such as the production of greenhouse gases and the increasing cost of fossil fuels—are sparking greater interest in renewable sources of electrical energy, including wind power. The term Wind power refers to the energy in currents of air (wind) that can be converted to electrical energy using a wind turbine. A group of wind turbines, referred to as a Wind Farm, is shown in Figure 3. The wind turbines shown in Figure 3 are Horizontal Axis Wind Turbines (HAWTs). 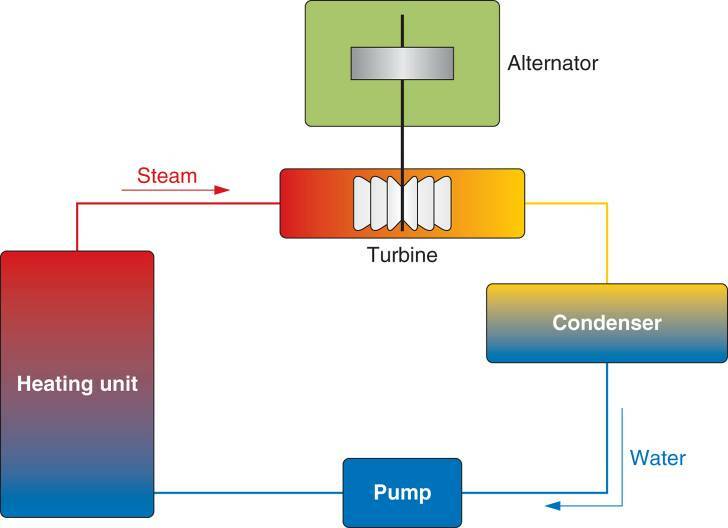 Each turbine contains a generator as shown in Figure 4. The turbine rotor is made up of the three blades, the low-speed shaft, and the driving great box. All but the rotor blades are contained in a housing called the Nacelle. 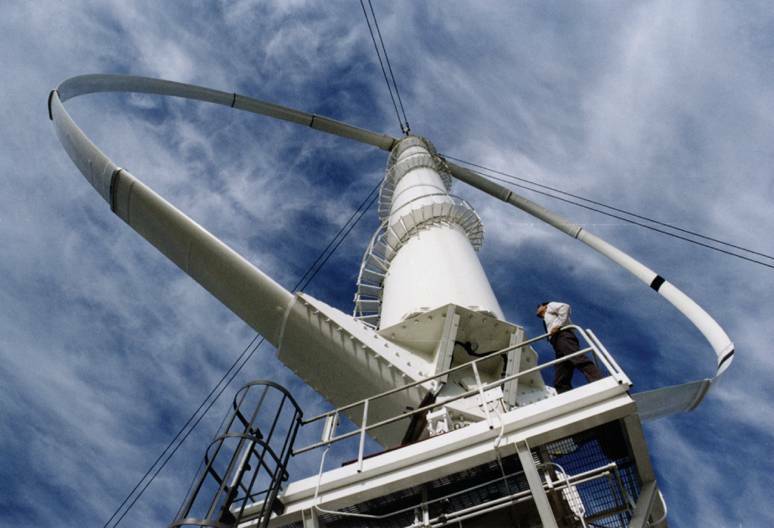 Figure 4: Horizontal-axis wind turbine (HAWT) construction. As the wind causes the rotor to turn, the driver gear turns the generator rotor. 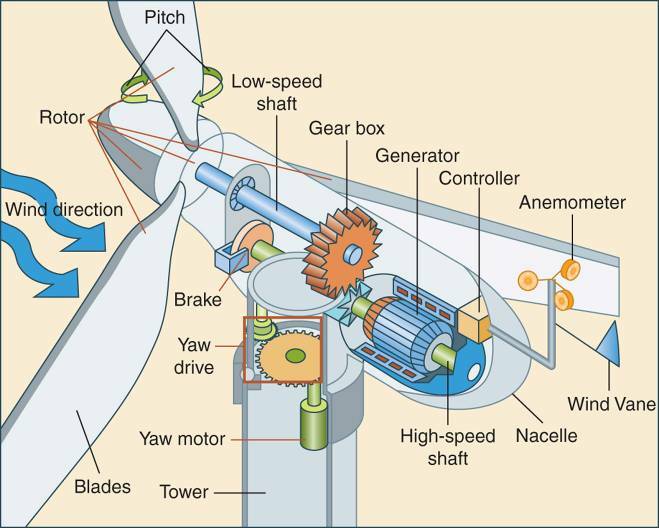 The Gear Ratio is such that the generator rotor spins much faster than the turbine rotor. Wires running down the tower transfer the electrical energy produced by the generator to an external pad mounted transformer. Finally, the Yaw motor and Yaw driver turn the rotor so that it faces directly into the wind. Horizontal Axis Wind Turbine (HAWT): A wind turbine with a three blade assembly that rotates on a horizontal shaft. Nacelle: The housing on a HAWT that contains the low-speed shaft and driving gear. Gear Ratio: In a series of gears, the ratio of the speed of rotation of the first gear to that of the last gear. Another type of wind turbine called a Vertical Axis Wind Turbine (VAWT) is shown in Figure 5. Figure 5: A vertical-axis wind turbine (VAWT). Though this type of wind turbine rotates on a vertical axis rather than a horizontal one, the overall principle of using wind energy to generate electrical energy is the same. Vertical Axis Wind Turbine (VAWT): A type of wind turbine that rotates in a vertical axis rather than a horizontal one. 1. VAWT’s are mounted so that the moving parts are closer to the ground. This makes it easier to perform maintenance and repair procedures. 2. VAWT rotation can be initiated at lower airspeeds than HAWT rotation. 3. VAWT’s are shorter than HAWT’s, allowing them to be used in areas where height prohibits the use of HAWTs. The moving parts of VAWT’s are located at the lower end of the VAWT, which means that they are positioned under the weight of the structure, this makes them more difficult to design. The blades of the VAWT are lower to the ground, where wind speed tends to be lower. Thus, a VAWT produces less electricity than a comparable HAWT. a. A turbine is a bladed rotor that is turned by water. b. A penstock directs the flow of water from the reservoir through the turbine. A step-up transformer connects the power station to the transmission lines. An impoundment dam completely blocks the natural flow of the river, and all the water flows through the penstock. A diversion dam only diverts part of the river’s water through the penstock. A steam-driven turbine is a prime mover in a thermal power plant. The yaw motor and driver keep the wind turbine facing into the wind to provide maximum power generation. A VAWT is a vertical axis wind turbine. VAWTs are easier to maintain, will rotate at lower wind speeds and are shorter (less intrusive) than HAWTs. However, they are less efficient, are more difficult to design, and because they are lower to the ground, they are not exposed to higher wind speeds.